This was from the annual "Michigan Festival", probably 1991. 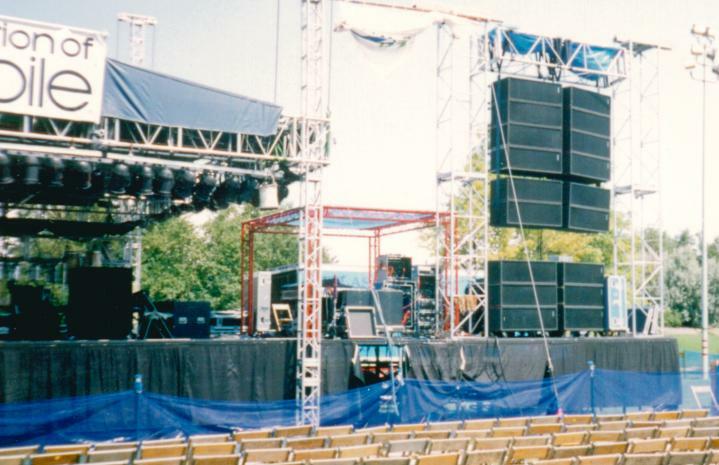 The main stage was right outside Munn Ice Arena at Michigan State University, and had audiences of up to 50-60 thousand people for each night of the 10-day run. Headliners included (I'm a bit fuzzy about who played which year) REO Speedwagon, Ray Charles, Lyle Lovett, Charlie Daniels Band, Count Basie Orchestra, and Joan Baez. That small red truss in the middle of the photo covers monitor world, my territory for the festival. If you look closely you'll also notice a lot of red cables, another part of the various red-colored things MacPherson inherited after we merged with RED Acoustics, a maker of self-amplified speaker systems. RED was mostly defunct by then, but we used their very cool coaxial 8" woofer/tweeter to make the MacPherson Model Four speaker. The main speaker arry shown here was made up of the MacPherson Model One speakers. Back to the audio page.